My local church’s recent study into Christian Conflict Resolution led us to explore something critical about the commands of God that is often overlooked, abused, or ignored. You can hear the message I delivered to the church on that subject above. The founding fathers had another way of expressing it. What did the founders mean when they wrote that “all men are created equal”? Did they mean that all men are equal in all matters? For example, did they mean that all men were born into equal social position? Did they mean that all men are born into equal financial situations? Experience would deny those interpretations. The founders themselves recognized from their own experience in many of their writings that different men were born into different situations. Did they mean that all men were equally talented? That all men were equally intelligent? Once again, experience would deny these assertions. When the Founders of the Continental Congress signed the Declaration of Independence, they meant that all men were equally under the authority of God. They meant that all men were equally accountable to God’s Law. In this opening paragraph, the Founders appealed to the Law of God as their standard. Furthermore, they apparently believed that not only citizens, but also civil magistrates were accountable to the Law of God. While they may have fought for separation of church and state, they apparently did not believe in separation of God and state. In the main body of the Declaration, they enumerated the ways that King George had violated the Law of God, and they argued that these violations demonstrated such a rebellion against God’s Law that King George could no longer be their civil magistrate. In other words, King George had strayed so far from being under the authority of God, that the colonists could not be under King George’s authority and also be under God’s authority. Such an idea would have been radical two-to-three hundred years before in England when the King was thought to be the Law of God on earth. That England believed Rex Lex – “the King is Law.” They construed passages such as Romans 13 in such a way as to assert that whatever the King did was what God had inspired him to do. Over the course of the 1600’s, Great Britain slowly began to wake up to the truth of what Samuel Rutherford called Lex Rex – “the Law is King.” They began to understand the Reformation principles of the Bible that all men are equally sinful before a righteous God and that all men are equally accountable to the transcendent Law of God. When King Charles I began imprisoning people without cause and tried dissolving Parliament, he quite literally lost his head. As leaders such as Oliver Cromwell would explain, King Charles I had exceeded his jurisdiction, violating the Law of God. Last month we celebrated and gave thanks to God for our Founders who were bold enough remind the world that God governs in the affairs of men, and defy a Law-breaking King. 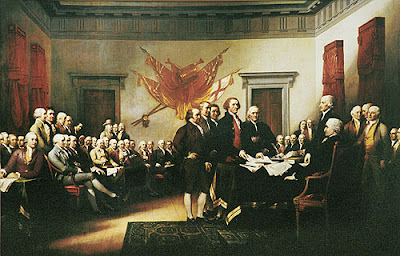 They were full of such faith and “firm reliance on the protection of Divine Providence” that they were not afraid to pledge their lives, fortunes, and sacred honor. If we hope to honor their legacy, then we will continue to promote the biblical principle that all men, regardless of their rank or status, are equally accountable to the Word of God. More importantly, if we hope to follow in the example of Jesus Christ, we will obey His commands to hold every man accountable to God’s Word “without respect of persons” (Romans 2:11).